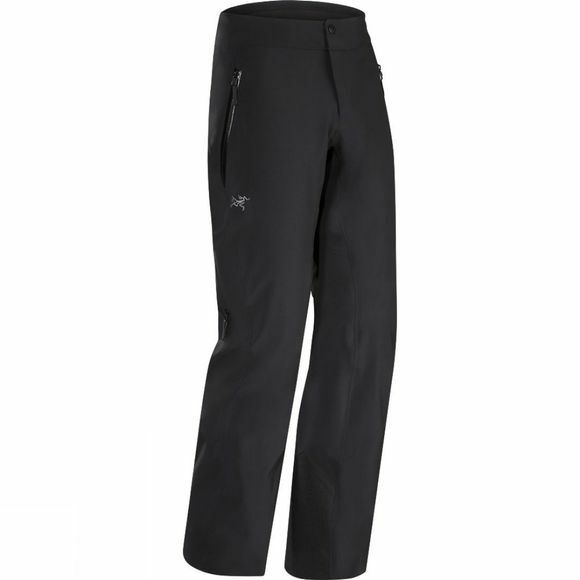 Made with Gore-Tex Pro fabric, the tough, efficient and hard-working Arc'teryx Men's Cassiar Pants provides complete weather protection and is engineered for deep powder days in the backcountry. Forward leaning articulation in the knees and seat delivers complete freedom of movement, and the high coverage bib wraps the waist to create a complete overlap under a shell jacket's hem. Articulated patterning and the gusseted crotch provide extended mobility without sacrificing coverage. The athletic fit is streamlined but accommodates layers, and Arc'teryx' e3D patterning provides generous mobility. The three-quarter-length side zips provide rapid ventilation on the uphill, and large volume external thigh pockets lie flat when empty. Two pockets on the bib provide secure storage. Water-resistant zips deliver a secure seal, but won't accumulate snow. Adjustable, integrated suspenders attach to front of bib to secure the fit.